SCP/TAPS represent a diverse family of proteins in eukaryotes, including pathogens. An analysis of structure-based amino acid sequence alignments of SCP/TAPS proteins (also called activation-associated proteins, ASPs) from the blood-feeding hookworm, A. caninum, reveals at least three distinct groups. This analysis combined with comparative modelling showed that all known ASPs have an equatorial groove, suggesting that it binds extended structures, such as peptides or glycans. 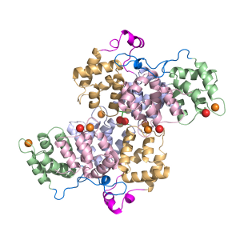 The topology seen in the crystal structure of a representative group 2 ASP (designated Ac-ASP-7) is consistent with pathogenesis-related proteins, with the N-terminal domain adopting the SCP/TAPS fold, and the C-terminal extension resembling the fold of the Hinge domain. 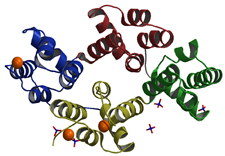 By anomalous diffraction, a new metal binding site in the C-terminal extension of the protein was observed (Ca2+, Mn2+). In solution, Ac-ASP-7 is in a monomer-dimer equilibrium, and crystal packing analysis identified a dimeric structure which may resemble the homo-dimer in solution. 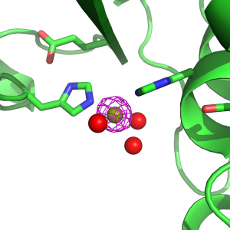 The dimer interaction interface includes a novel binding site for divalent metal ions, proposed to serve as a binding site for proteins involved in the parasite-host interplay at the molecular level. Alpha-giardins constitute the annexin proteome (group E annexins) in the intestinal protozoan parasite Giardia, and as such represent the evolutionary oldest eukaryotic annexins. alpha-1 giardin localises to the plasma membrane of Giardia trophozoites and has recently been identified as a vaccine target. The structure was solved using the anomalous signal of the tantalum bromide cluster [Ta6Br12]2+ synthesised in house. Structure determination further involved the hybrid modelling-replacement approach provided by ROSETTA and Phenix. The structure of Anx24 from bell pepper was the first structure of any plant annexins to be solved. Hydrophobic and basic residues on the convex (membrane-binding) side of the protein are responsible for a second, calcium-independent membrane binding mode which seems to be a characteristic feature of several plant annexins that distinguishes them from their vertebrate relatives. Human annexins A3 and A5 were complexed within the crystals with BDA452, a new 1,4-benzodiazepine derivative. BDA452 binds to a cleft which is located close to the N-terminus opposite to the membrane binding side of the proteins. Biophysical studies of the interactions of various benzodiazepine derivatives with annexins were performed to analyse the binding of benzodiazepines to annexins and their effects on the annexin-induced calcium influx into phospholipids vesicles. Benzodiazepines modulate the membrane effects of annexins allosterically. 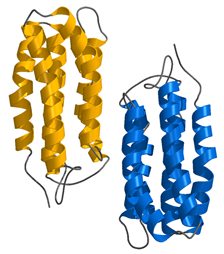 The crystal structure of calcium-free recombinant human annexin VI shows two similar halves closely resembling annexin I connected by an -helical segment and arranged perpendicular to each other. The calcium and membrane binding sites assigned by structural homology are therefore not located in the same plane. Analysis of the membrane-bound form of annexin VI by electron microscopy shows the two halves of the molecule coplanar with the membrane, but oriented differently to the crystal structure and suggesting a flexible arrangement (see also structure by Kretsinger's group: PDF). Using structure-based amino acid sequence alignments, we identified a structural feature shared by several (but not all) annexins from parasitic organisms that presents a novel element of those annexins and is thus absent from any of the mammalian annexins. Many schistosome annexins, and those from T. solium (annexins B1, B2, B3), C. elegans annexin B36, as well as alpha12- and alpha19-giardin possess an unusually long linker segment between repeats II and III on the concave side of the protein. The crystal structure of annexin B22 confirms the presence of the previously predicted alpha-helical segment in the II/III linker and reveals a covalently linked head-to-head dimer. 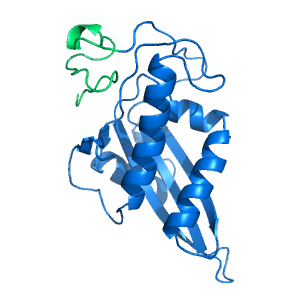 From the calcium-bound crystal structure of this protein, canonical type II, type III and B-site positions are occupied, and a novel binding site has been identified. 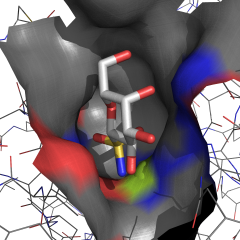 The dimer arrangement observed in the crystal structure suggests the presence of two prominent features, a potential non-canonical membrane binding site and a potential binding groove opposite to the former. Crystals of annexin B22 required dehydration to achieve diffraction up to 2.2 Å. The structure was solved with Pr-MAD. The structure indicates that canonical calcium binding is geometrically possible within the membrane loops in domains I and II. The tryptophan residue in the IAB loop, which is highly conserved in plant annexins, is in a surface-exposed position, half way between both conformations observed in Anx24(Ca32). An unusual sulphur cluster formed by two cysteines and a methionine in domains II and III with S-S distances of about 5 Å might form the molecular basis for annexin function in oxidative stress response. 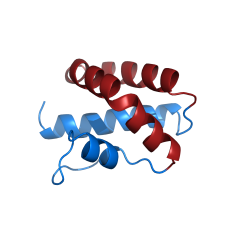 The crystal structure of beta-glucosidase A (BglA, EC. 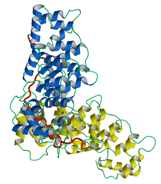 3.2.1.21) from the halothermophilic bacterium Halothermothrix orenii has been determined at a resolution of 3.0 Å. The structure with two molecules in the asymmetric unit was solved by molecular replacement using a library of known glucosidase structures. A Ni2+ ion, presumably acquired during purification, was found in the active site. Plant annexins show distinct differences when compared to their animal orthologues. In particular, the endonexin sequence, which is responsible for coordination of calcium ions in type II binding sites, is only partially conserved in plant annexins. The crystal structure of calcium-bound cotton annexin Gh1 was solved at 2.5 Å resolution, and shows three metal ions coordinated in the first and fourth repeat in type II and III binding sites. While the protein has no detectable affinity for calcium in solution in the presence of phospholipid vesicles, we determined a stoichiometry of four calcium ions per protein molecule using isothermal titration calorimetry. Further analysis of the crystal structure shows that binding of a fourth calcium ion is structurally possible in the DE loop of the first repeat. Data from this study are in agreement with the canonical membrane-binding of annexins which is facilitated by the convex surface associating with the phospholipid bilayer by a calcium bridging mechanism. In annexin Gh1, this membrane-binding state is characterised by four calcium bridges in the I/IV module of the protein, and direct interactions of several surface-exposed basic and hydrophobic residues with the phospholipid membrane. A new class of carbonic anhydrase (CA) inhibitor was designed to selectively target the extracellular domains of the cancer-relevant CA isozymes. The aromatic moiety of the classical zinc binding sulfonamide CA inhibitors is absent from these compounds and instead they incorporate a hydrophilic mono- or disaccharide fragment directly attached to the sulfonamide group to give S-glycosyl primary sulfonamides. We solved the crystal structures of three anomeric sulfonamides and the sugar sulfamate drug topiramate in complex with human recombinant CA II. From these structures we have obtained valuable insights into ligand-protein interactions of these novel carbohydrate-based sulfonamides with CA. A survey of genomic shows that P. aeruginosa possesses two TPP proteins, one with chromosomal and one with extra-chromosomal location. Notably, the occurrence of both proteins is mutually exclusive; all P. aeruginosa strains for which information is available to date possess either the chromosomal (Paer-chTPP) or the plasmid-encoded (Paer-ecTPP) trehalose 6-phosphate phosphatase. 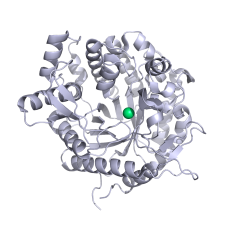 The crystal structure of Paer-chTPP shows that the protein adopts the general fold known from other halo-acid dehydrogenase (HAD) superfamily (IPR023214) enzymes. The structure reveals a homodimer where the central β-sheet of the core domain is extended to a twelve-stranded β-sheet and the dimer interface is further expanded by the formation of a four-helix bundle. An intriguing novel structural element is the first connector between the HAD core and the cap domain. 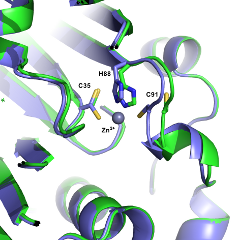 Whereas the segments connecting cap and core domains in TPPs are typically short extended/unstructured loops, the N-terminal connector is replaced here by a long bent α-helix with Trp111 at the bending point. This connector fold constitutes a rather rigid attachment of the cap to the core domain owing to the inherent directional stability of the helical fold. CAP is a highly conserved and widely distributed protein that links the nutritional response signalling to cytoskeleton remodelling. We solved the orthorhombic crystal structure of the N-terminal domain of CAP that occurred due to auto-proteolytic cleavage in preparations using the full-length protein. Comparison with other CAP structures reveals variable modes of dimerisation of this domain, but the presence of a common interface for the side-to-side dimer. Crystals of cyclic green fluorescent protein (cGFP) engineered by the split intein technology in the group of A Plückthun were obtained and the structure was solved using molecular replacement. Although the core of the protein can unambiguously be fitted from the first to the last residue of the genuine sequence, the electron density in the region of the linker peptide is rather poor owing to the high water content of the crystals. Therefore, it is concluded that this part of the protein is highly disordered in the present structure and is very flexible. Nevertheless, the density is consistent with the loop being intact, as confirmed by mass spectroscopy of dissolved crystals. 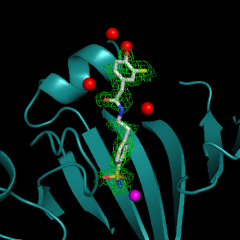 This structure contains an antiparallel cGFP dimer where the dimer interface is clearly different from other crystal structures featuring two GFP molecules. The cylinder surface of GFP is rather versatile and can employ various polar and non-polar patches in protein-protein interactions. The oxidised structure of cyclic nucleotide phosphodiesterase (CPDase) from Arabidopsis thaliana was the first one to be solved for any member of this family of 2H phosphodiesterases. The name stems from the signature tandem motif constituted by two H-X-T/S-X sequences. 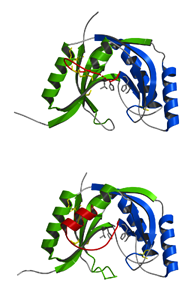 CPDase possesses six cysteine residues, four of which are involved in forming two intra-molecular disulfide bridges. One of these bridges, between Cys-104 and Cys-110, is opened in the semireduced CPDase, whereas the other remains intact. This change of the redox state leads to a conformational rearrangement in the loop covering the active site of the protein. 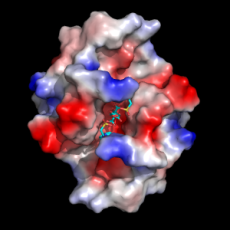 While the native structure shows this partially disordered loop in a coil conformation, in the semireduced enzyme the N-terminal lobe of this loop winds up and elongates the preceding alpha-helix. The semireduced state of CPDase also enabled co-crystallization with a putative inhibitor of its enzymatic activity, 2',3'-cyclic uridine vanadate. The main target of this plant protein is ADP-ribose 1'',2''-cyclic phosphate, a product of the tRNA splicing reaction. 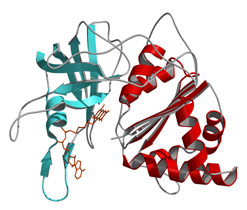 The first crystals of this protein were obtained accidentally during our efforts to crystallise native annexin 24(Ca32) purified from bell pepper. Subsequently, the cDNA of this protein was prepared, and the complete gene encoding paprika ferredoxin-NADP(+) reductase (pFNR) precursor was sequenced and cloned. 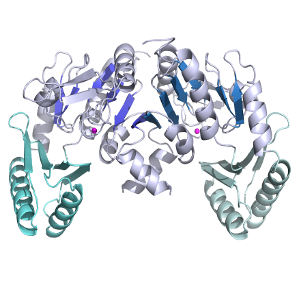 The overall structure of pFNR is similar to other members of the ferredoxin-NADP(+) reductase family, the major differences concern a long loop that forms part of the FAD binding site and some of the variable loops in surface regions. A library of natural products and their synthetic derivatives has been investigated for enzyme inhibition against carbonic anhydrases (CAs), comprising the two human alpha-family CAs I and II and two Mycobacterium tuberculosis beta-family CAs. In support of this study, the structures of several compounds from this library were determined in their enzyme-boudn forms, using human CAII. Hookworm activation-associated secreted proteins (ASPs) can be structurally classified into at least three different groups. 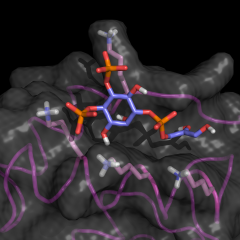 The hallmark feature of Group 1 ASPs is a prominent equatorial groove, which is inferred to form a ligand binding site. Furthermore, a conserved tandem histidine motif is located in the centre of the groove and believed to provide or support a yet to be determined catalytic activity. We solved the three-dimensional crystal structures of Na-ASP-2, an L3-secreted ASP from the human hookworm, which demonstrate transition metal binding ability of the conserved tandem histidine motif. We further identified moderate phosphohydrolase activity of recombinant Na-ASP-2, which relates to the tandem histidine motif. By panning a random 12-mer peptide phage library, we identified a peptide with high similarity to the human calcium-activated potassium channel SK3, and confirm binding of the synthetic peptide to recombinant Na-ASP-2 by differential scanning fluorimetry. Potential binding modes of the peptide to Na-ASP-2 were studied by molecular dynamics simulations which clearly identify a preferred topology of the Na-ASP-2:SK3 peptide complex. Chemical probing of the mycobacterial β-carbonic anhydrase Rv1284 using protein crystallography and stopped-flow enzyme assays show that the catalytic activity can be reversibly inhibited by oxidation. These findings link conditions of oxidative stress to pH homeostasis of the pathogen, and also support the notion that mycobacterial carbonic anhydrases can be targeted with non-classical inhibitors binding at the protein surface. Ac-SLP-1 and Na-SLP-1 are non-orthologous proteins. 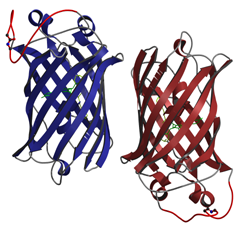 Both proteins share the property of membrane binding. 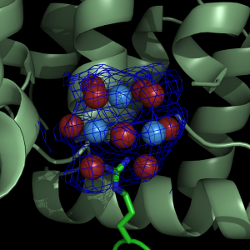 In contrast to Na-SLP-1, the three-dimensional structure of Ac-SLP-1 suggests that membrane interactions are most likely initiated by a unique tryptophan residue that has previously been implicated in membrane interactions in other SAPLIPs. With Ac-SLP-1 we analysed 4 native and 12 derivatised crystals with 7 heavy atom compounds. The crystal structure was solved with Pt-SIRAS. Saposin-like proteins (SAPLIPs) from soil-transmitted helminths play pivotal roles in host-pathogen interactions and have a high potential as targets for vaccination against parasitic diseases. Na-SLP-1 adopts the general SAPLIP fold which is comprised of a four- or five-helix bundle, where a kink in the third helix can lead to occurrence of two helices. In total, four datasets of native crystals, as well as 29 datasets of crystals derivatised with 12 heavy atom compounds were collected. The structure was solved with Pt-SIRAS. The structure shows that initial membrane contact of the monomeric Na-SLP-1 is most likely by electrostatic interactions between the membrane surface and a prominent basic surface patch.